Questionnaires are a very useful research ‘tool’. If the right questions are asked, the findings can help to guide the development of a product. The key is to ask the right focussed questions and to analyse the findings carefully. The questions should be targeted and direct, not general. Only ask relevant questions. For example, asking potential customers of a house alarm system, ‘how many zones (rooms) must the alarm cover protect?’ is a direct and necessary question. It will help you to determine how many inputs (sensors) the alarm circuit requires. However, asking potential customers, ‘do you want the alarm to be loud?’, is far too generalised and will not return important research. Asking questions that help you determine the needs or requirements of the customer, also helps the designer to focus on important research information. Questionnaires can involve multiple choice questions and consider using images / photographs. 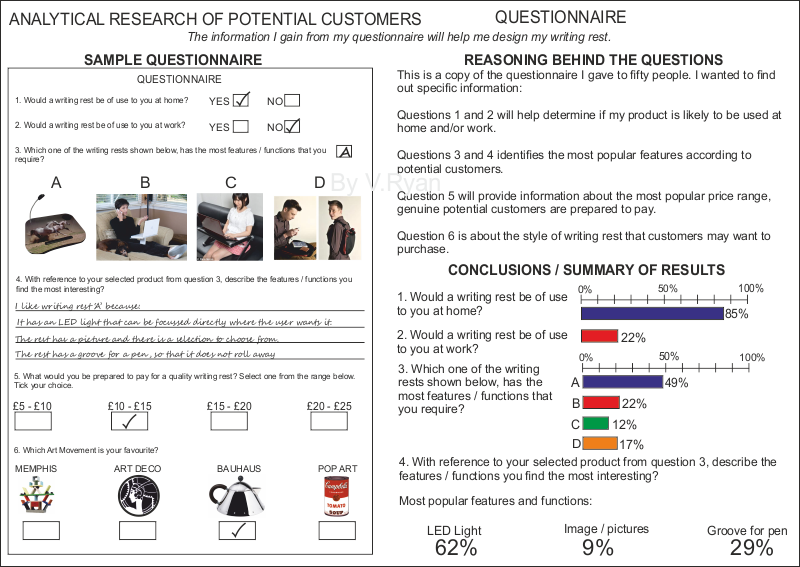 Constructing a questionnaire, to determine the features and functions that potential customers would like to see in a final product, is a good starting point. ‘Open’ questions allow the respondent freedom to reply through writing sentences, expressing his / her thoughts. Allowing the respondent to ‘tick’ multiple answers, can give precise information for a designer. For business or commercial reasons, it is important to work out, how much a potential customer is prepared to pay for a product, or at least a cost range. There is still a place for a limited number of generalised questions. A good example of this is when asking a potential customer or a client about the design styles / art movements. Finding this out, may help when considering the overall look of a product, it’s aesthetics. Asking the potential customer to prioritise OR number in order of preference, is another powerful survey technique. The sample questionnaire / survey sheet shown below is divided into three distinct sections. This sample page is the questionnaire sheet, aimed at helping in the design of a writing rest, to be used when sat on an easy chair. On the left is a sample sheet is a completed questionnaire, showing the questions asked. To the top right section of the sheet, outlines the reasons behind asking each of the questions. This justifies why the 'focussed' questions have been asked. The section at the bottom left is a summary of findings / conclusions. This section basically states through text and graphs, the answers that have been given nto the questions.